I have been lucky the past few years that a good friend has let me use his Neway setup to do valve jobs myself. I got sick of long waits and poor work locally, and shipping was such a hassle to get them to professionals. Well I would like a decent set myself. Add to that I have a big flathead in my garage needing some slight seat cleanup.... I want to get my own set. Neway is quite expensive. I see cheap stuff all over eBay, but get the same feeling about that over any cheap import tools. Looking for suggestions from others who have their own sets. I have a complete set-up for valves and seats made by Sioux probably back in the early 50's. It uses different grit stones in holders for seats. Got it used from a unfortunate friend going through a divorce. Everything is still tight and repeatable with stone sizes from Briggs & Stratton the big block Chevy. Love it. Only issue is if the armature ever burns up in the right angle motor, I'm toast. Cylinder head supply has good prices on these cutters (neway) give them a call or go online to look them up. I bought a set of Neway cutters about ten years ago and have used them on four sets of heads. Would say they have paid for themselves already. I bought my set used on ebay and it had most of what I needed and I bought a few more pieces over the last couple of years. Works well once you get confident on the cuts. I too have the Neway, wouldn't go any other way. I do cut the valves on the lathe though, the intake valves really want to chatter on the Neway cutter. You do need to keep on top of the cutter bits as they will dull and chip fairly easily. It is really harder than you think but the do get dull and chip. I have changed out probably 5 sets over the last 20 years. > do cut the valves on the lathe though. Ken, I have access to both my Sioux valve face grinder and a lathe. 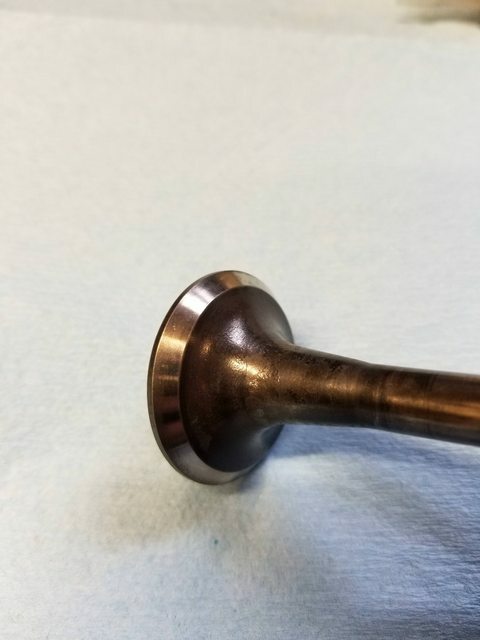 What do you use to reface turbo exhaust valves in a lathe? I use my carbide inserts in the bits. They need to be set just a little low and you will probably get about 4-6 valves per tip. If I would spend the money on the really hard inserts I might get more valves per tip. I also sometimes have to use a finger on the head of the valve to stop chatter or ringing. It takes practice but if you have a valve facer use it. Thanks all. I decided to bite the bullet and get the Neway stuff from CHS. Few extra days but they are the tools I have used and know. In terms of cutting valves themselves, my buddies Sioux machine is great. Hopefully he will let me still use it a while longer. 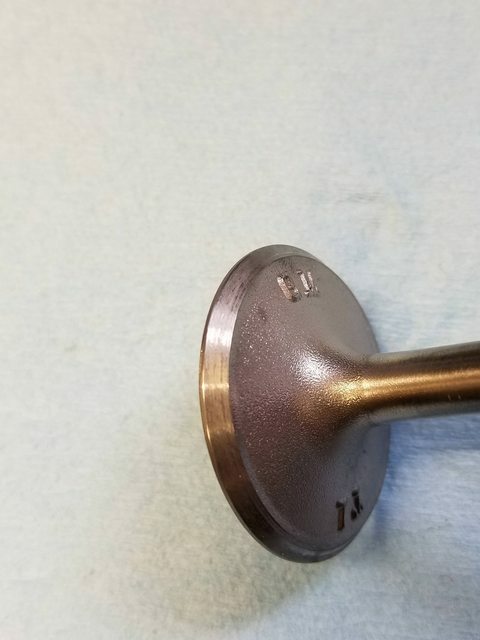 Just so you know here is what the lathe can do on the exhaust valves. 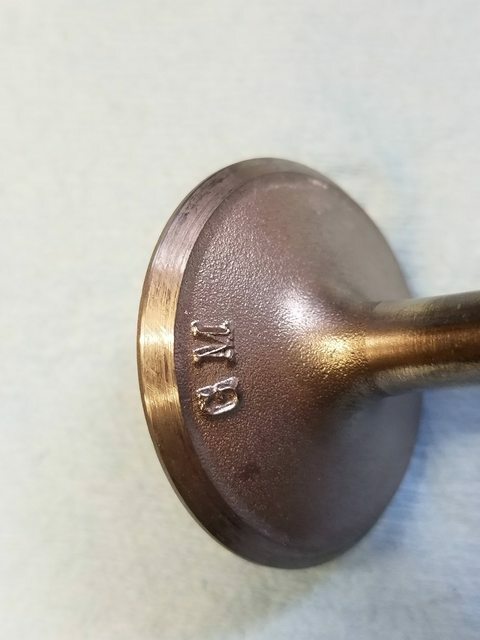 Yes, that is a possible crack in the valve face! And as I said the Neway valve cutter can get a little harsh on the soft intake valves. If you look close you can see some of the chatter marks in the face. They are the marks at 45 degrees to the face. This is cleaned up on the lathe. 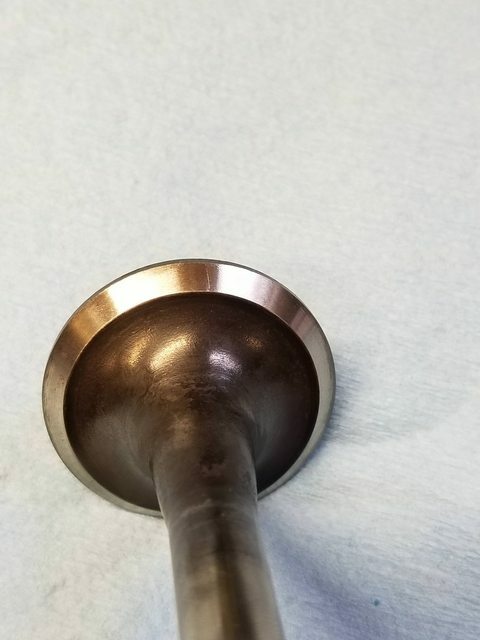 In the second picture you can see that even the intake valves have hard spots.